Due to its dimensions and/or weight, this item ships via GROUND service only. Solvit Telescoping Ramp Deluxe can be fully extended for SUVs, pickups, grooming table, etc. Shorten the ramp when space is limited or when the upper surface isnt as high, such as a bed, couch, or minivan. A unique, wavy walking surface with non-slip tread gives pets a sure footing, especially on steep climbs. This model is super lightweight at 13 lbs and it supports over 400 lbs with no bending! 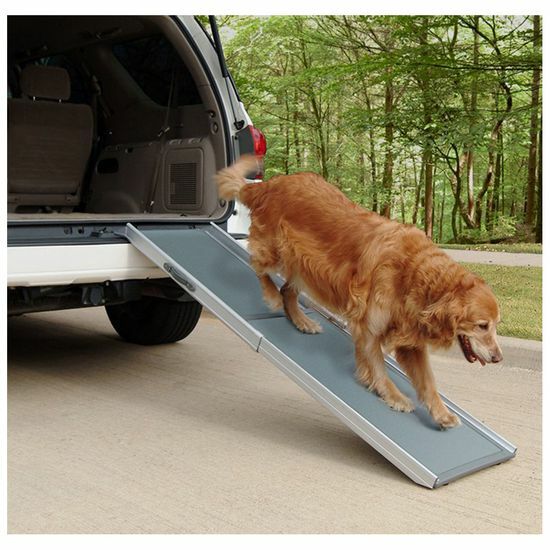 Its combination aluminum and plastic design make it the lightest & strongest pet ramp on the market. Its also more compact, making it easier to use and store. The ramp also includes a convenient carry handle and safety release latch to prevent accidental opening. The ultra stiff design utilizes four rubber feet to keep the ramp stable while in use. Measures 39-72 x 17 x 4 inches. Infinitely adjustable from 39 in. to 72 in - perfect for all heights to 36"
My dog is two years old and perfectly capable and willing to jump in and out at this time. My dog had no problem learning to use the ramp. I still let him hop in but use it faithfully for coming out. This ramp is saving his joints and I can already see a difference in his movement. Well worth the price compared to the vet bills and supplements he would have needed eventually. I have only one complaint and I think it is important to share. The bottom of the ramp did not have plastic guard on the edge of the aluminum. The top does. After using a few times the bottom gets sharp and I cut my hand pretty bad.